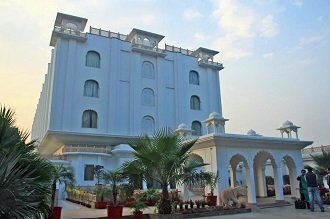 Situated on Fatehbad road. This hotel bears a total of 62 rooms. The gourmets can satiate their taste buds at the multi-cuisine restaurant, or simply unwind at the 24 hrs coffee shop, which overlook the swimming pool. A bar, serving exotic cocktails and mocktails is also available. There is also a gymnasium and a full service spa, including sauna, steam and jacuzzi for rejuvenation. Other hotel facilities include laundry service, doctor on call, travel services and 24 hrs room service.